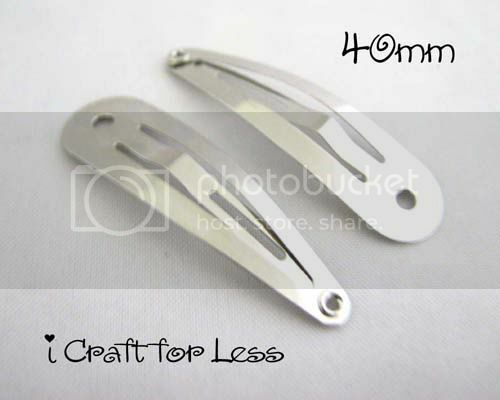 This is for 50 (fifty) metal snap clips with a hole that are perfect for making your embellished hair clips. They are silver in color and measures about 1 1/2 inches (40 mm) long and 7/16 inch (11 mm) wide. The little hole measures 3/32 inch (2 mm) in diameter. Add your bows, buttons, feathers, flower or appliqués to create one of a kind clips. Check out our shop for different sizes and quantities, and for all your supply needs. We do offer combined shipping. To receive combine shipping, please go ahead and purchase your items, but do not pay. You can either request for a total or email us. We will then adjust your order and send you an invoice reflecting the combine shipping cost. If you should pay without us adjusting for combine shipping, please don't worry, we will refund back any overpayment on shipping cost.